The goal at the inception of the programs was to implement CPD/CME accredited, affordable and high quality Focused Cardiac Ultrasound (FCU) education solutions for local hospital staff in Brisbane. Dr Nathan Peters, the current champion of the FUSE programs at RWBH, saw the introduction of FUSE education as a way of removing significant barriers that currently limit the utilization of FCU in the hospital. 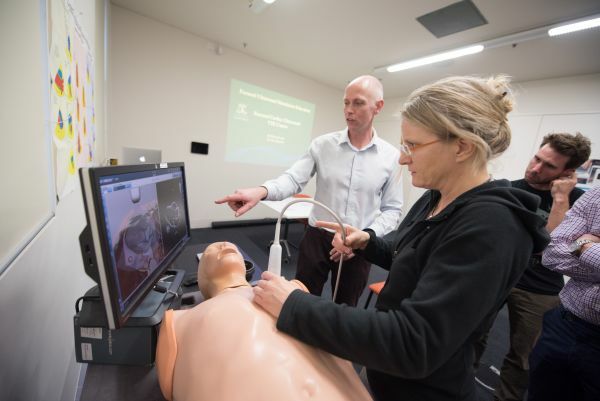 Now hosted by the state-of-the-art Centre for Excellence and Innovation in Anaesthesia (CEIA), the FUSE programs are continually growing to become recognized as an essential component of ICU training and other critical care specialities. With the rising demand for FCU training and a handful of enthusiastic experts, Nathan has set up the perfect environment the hospital’s very own training program. The self-directed and online learning principles of the course suit busy clinicians perfectly. As all the hard work of course design had already been done, these courses were easy and quick to implement. Nathan is delighted with the successful uptake of the FUSE courses: “Overall, everyone has been very happy with the choice of the FUSE programs in our hospital”. The University of Melbourne runs its own FUSE programs at the Royal Melbourne Hospital and now assist with the running of FUSE programs out of the RBWH. Setting up your own program is easy. If you would like to find out more on setting up a FUSE program or similar at your hospital or institution, contact the Ultrasound Education Team. The FUSE Programs are proudly hosted by the newly developed Centre for Excellence and Innovation in Anaesthesia (CEIA), a high-end teaching, training, testing and research centre in Anaesthesia at the Royal Brisbane and Women’s Hospital. The primary goal of the CEIA is to advance and improve the level of treatment and care given to patients undergoing Anaesthesia through world-class clinical research and education.